Mix the physical word with a sprinkle of virtual data, spread it onto a mobile device and what do you have? A recipe for augmented reality, that’s what. For those of you who check-in using the location-based social networking app, Foursquare, there’s a new feature for you to check out: location layers. 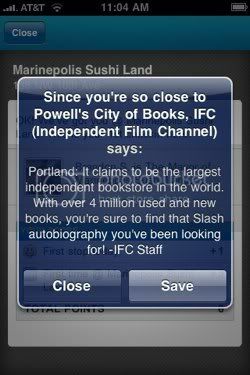 So far, the Independent Film Channel (IFC) and the Huffington Post have signed up to push location-relevant information to users who opt-in to the service. Imagine checking into your favorite bubble tea joint and finding that just 2 blocks away there’s a protest going on or a new theater’s been screening some interesting films. App developers have been very creative in getting augment reality (AR) mobile. A layer of information can be displayed over maps, video, even [pictures of] people! Check out Wikitude, the app that’s soon to put tour guides out of business. For more futuristic apps, click here. Learning has never been so… dimensional! Rare report provides the leading points on the nfl jersey that only a few customers know….